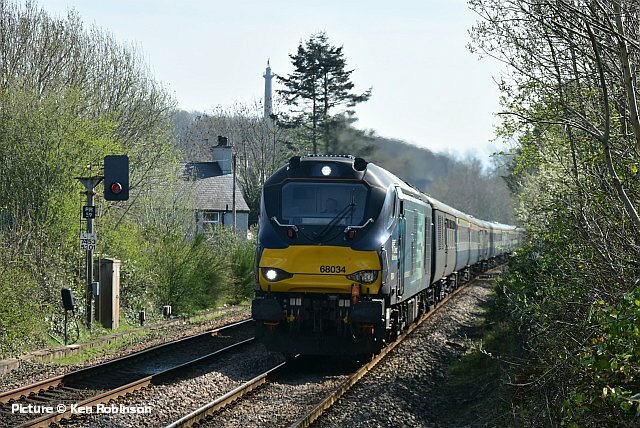 Friday 12 April Altrincham Electric Railway Society Great Western and Southern Steam in the West Country. A colour slide presentation by Alf Storey. Tuesday 7 May North Wales Railway Circle AGM and Members' Photo. Competition. 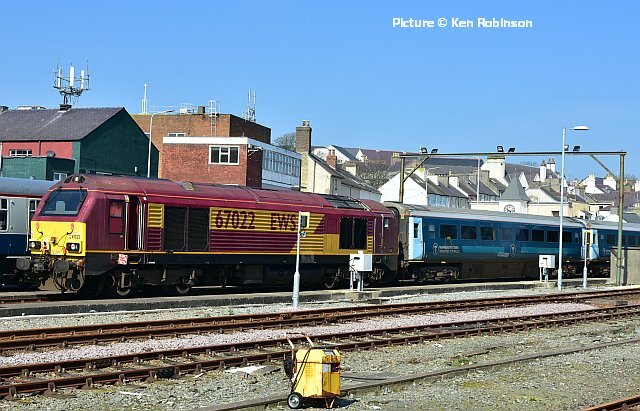 158 836 remains in traffic in the new livery but without branding, as seen at Abergele on 6 April by Greg Mape. 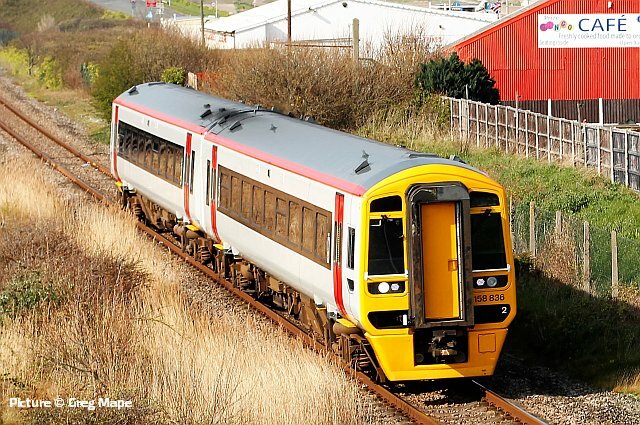 Does this suggest that the 158s are being painted, unlike the 175s which are receiving vinyl covering? Eddie Bellass of Newton-le-Williams, or DigitisED as he would sign himself in the early days of newsgroups, sadly died on 1 April, his 85th birthday. We remember well his friendly support for our early efforts on the web, and his many contributions to the uk.railway newsgroup, but in the annals of railway enthusiasm he will go down as the organiser of some truly memorable railtours on behalf of the Locomotive Club of Great Britain, such as the 'West Highlander' in 1972 which visited Fort William and Mallaig, travelling overnight on two consecutive nights. 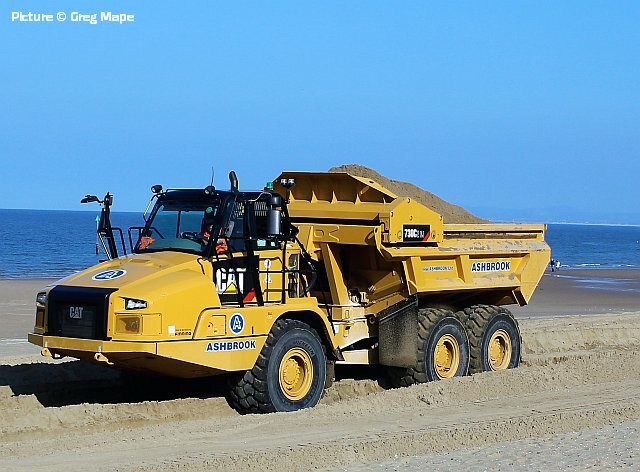 He also reported on north-west matters for Rail Enthusiast and Rail Express magazines. Born in 1934, Eddie worked for the Post Office in its telephone department, giving him a grounding in electronics which made him as natural early adopter of computers and the internet. He'll be missed. DRS 'cats' 68 017 Hornet and 68 005 Defiant power the 6K41 Valley to Crewe flask train through Llanfairfechan on 2 April formed of three of the new wagons. Fortunately it had just stopped raining! 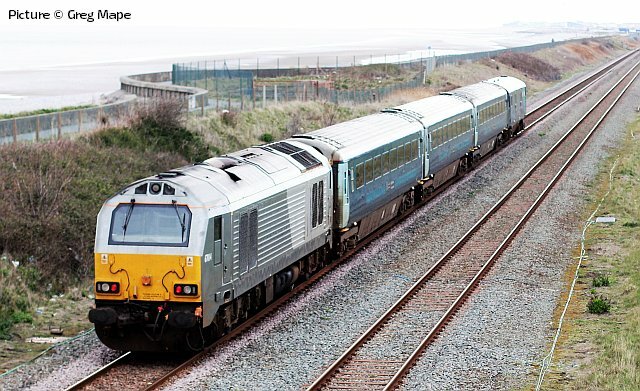 The 1D34 loco-hauled Transport For Wales service powered by 67 014 nears its destination of Holyhead having started its journey from Manchester Piccadilly at 09:53. A going-away shot with 82308 on the rear of the 1D34 loco hauled Transport For Wales service powered by DB Cargo 67014 as it nears its destination of Holyhead having started its journey from Manchester Piccadilly. 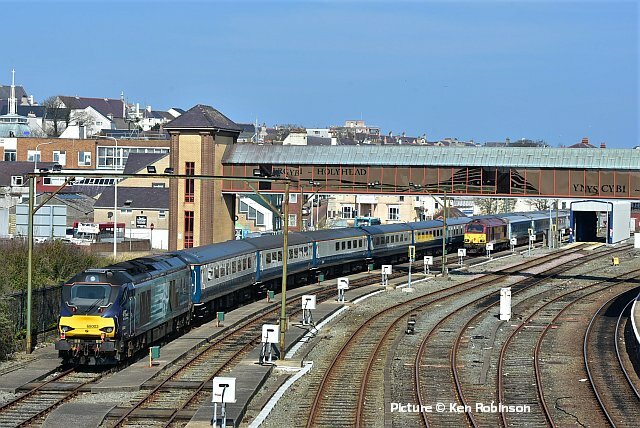 67 014 photographed again at Holyhead station. 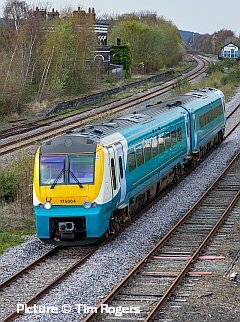 Various stories have been going the rounds about possible temporary rolling stock arrangements being pursued by Transport for Wales to bridge the gap until new stock arrives. 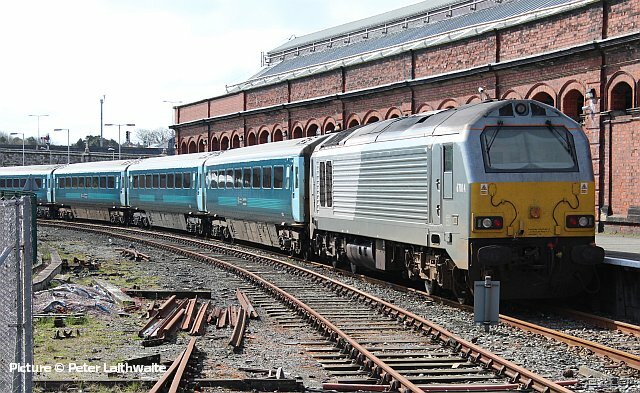 The supposed return of Class 37s to the Rhymney seems line to be actually taking shape, with 37 418 moved to Cardiff Canton for crew training, it seems that DRS will be providing the mk2 coaches, presumably ex-Cumbrian Coast, with Colas providing 37 418 and 37 421 for the traction. 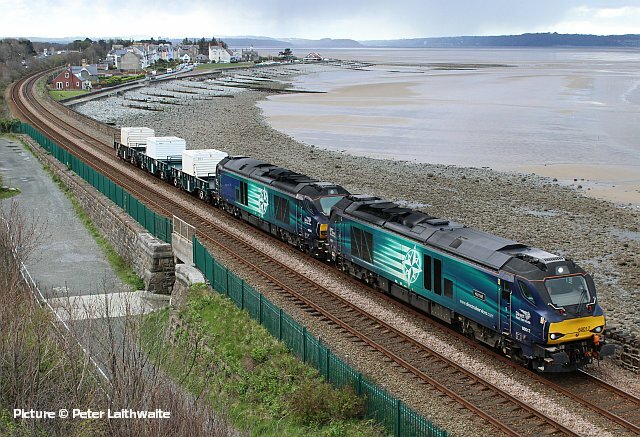 Elsewhere, there's rumour that at least the Manchester loco-hauled 'manwag' diagram and possibly some Cardiff - Holyhead workings going over to shortened 2+4 HSTs until the end of 2020, following the lead of Scotrail and Great Western. We've also hear it suggested that Class 185 units released from TransPennine will be drafted in. As we always say, time will tell. 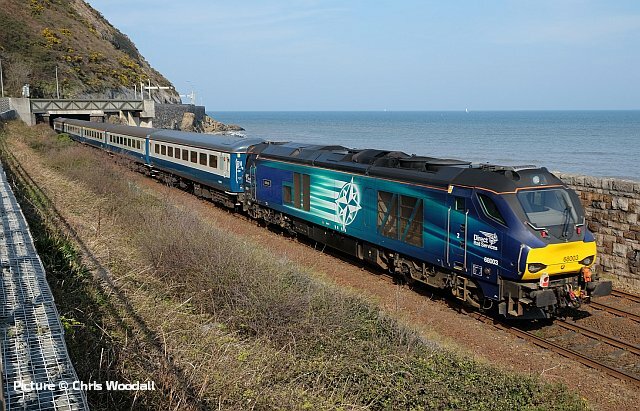 UK Railtours' 'Snowdonian Panorama' excursion on 6 April ran from London to Llandudno Junction with optional trips to Bodnant Gardens or the Ffestiniog/ Welsh Highland Railway. 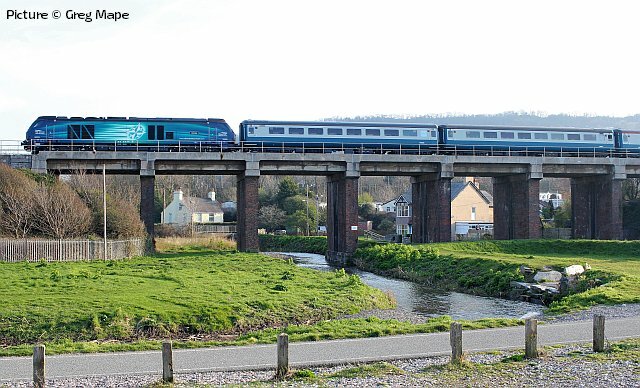 Greg Mape's pictures shows it passing Abergele westbound. You wouldn't know by its condition that the signalbox as been closed for some months. .. and 68 003 Astute, seen on the rear as the train enters Penmaenbach tunnel. Pictures by Chris Woodall. On Anglesey, approaching Llanfair PG (Ken Robinson). 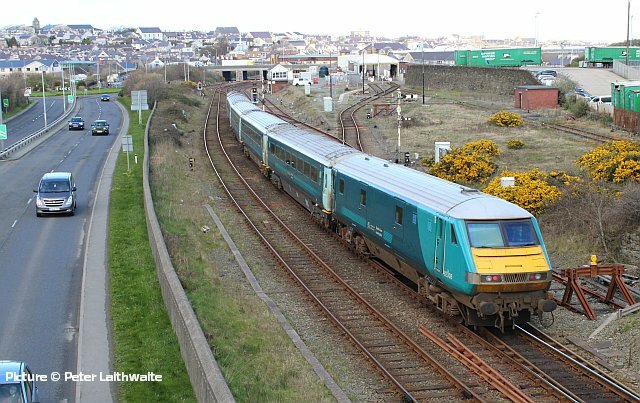 In the sidings at Holyhead (Ken Robinson). 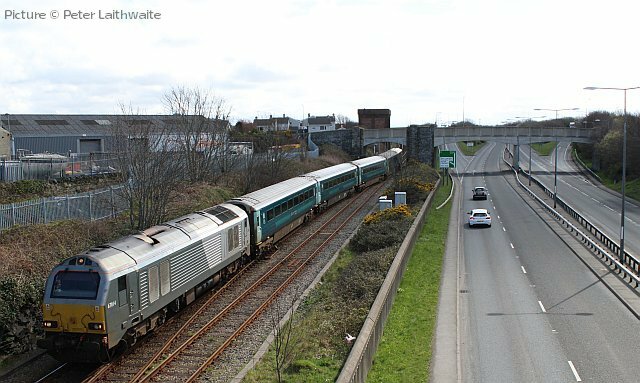 Also present, 67 022 with the coaches for the Holyhead - Cardiff express, which unlike any other TfW stock retaining its Arriva livery, now carries Transport for Wales branding (Ken Robinson). 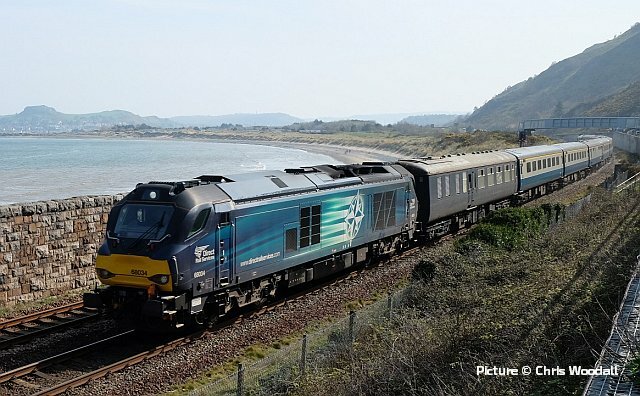 The return train on Llandulas viaduct with 68 003 leading (Greg Mape). 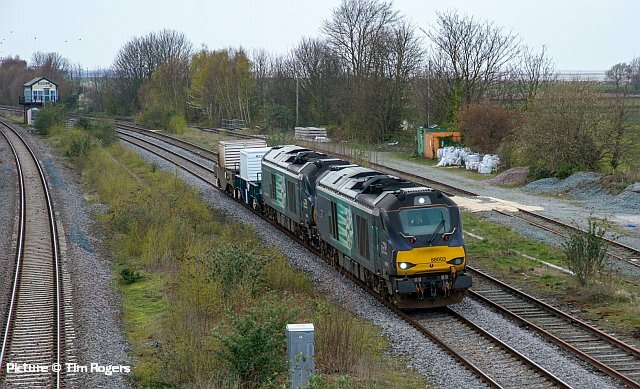 Northenden Junction on 7 April with the afternoon Doncaster Decoy – Liverpool biomass empties headed by 60 021 (Les Burton). 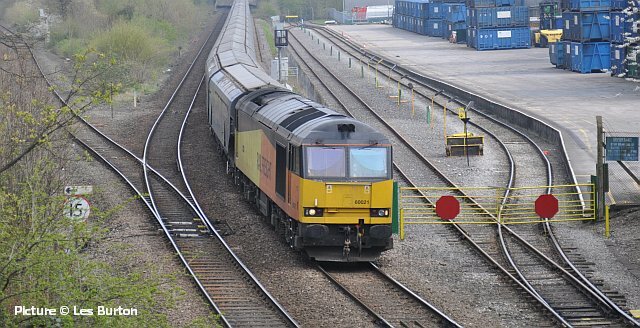 Class 60s (operated by GBRf who bought them from Colas but haven't got round to painting them all) are regular performers on the Drax trains lately. The line to the left goes to Hazel Grove High level Junction, the route of stone trains from the Peak District; the train has run via Guide Bridge and Stockport. On the right is the domestic waste terminal which dispatches train-loads of rubbish in containers to Runcorn Folly lane. 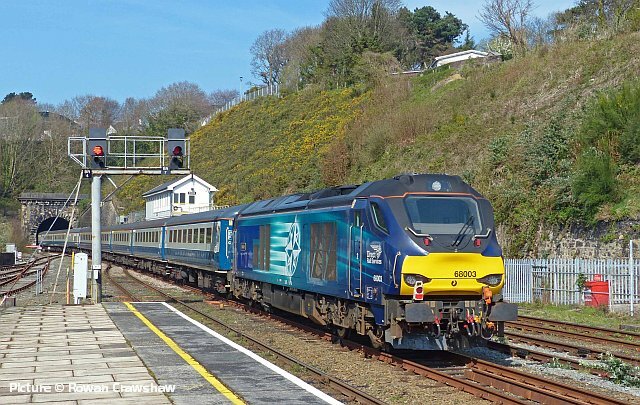 The 13:07 Holyhead to Manchester failed to depart from Holyhead on 5 April due to 'problems with the traction equipment'. 111 minutes later, the train ran empty-stock to Chester. seen passing Abergele with usual loco 67 014 pushing (Greg Mape). 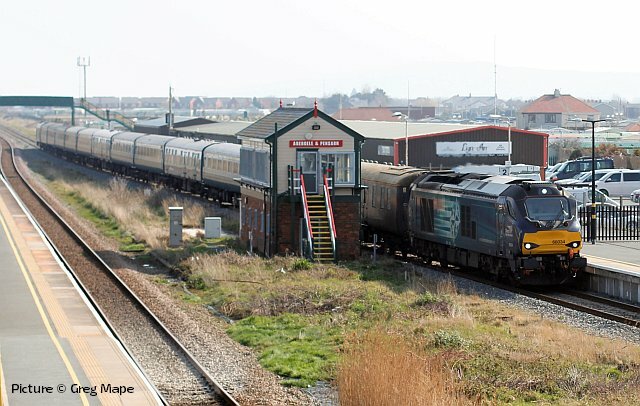 68 003 Astute and 68 033 at Holywell Junction with the Valley - Crewe flasks, 1 April (Tim Rogers). The flask traffic only ran twice this week; the reason we heard was that the crane at Valley was out for maintenance/inspection. 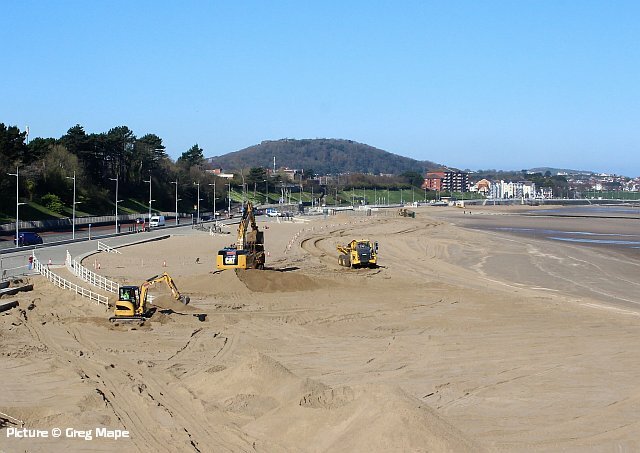 At Colwyn Bay, where the pier has now been reduced to just a tidied-up short stub, sand is being moved along the beach on an industrial scale. 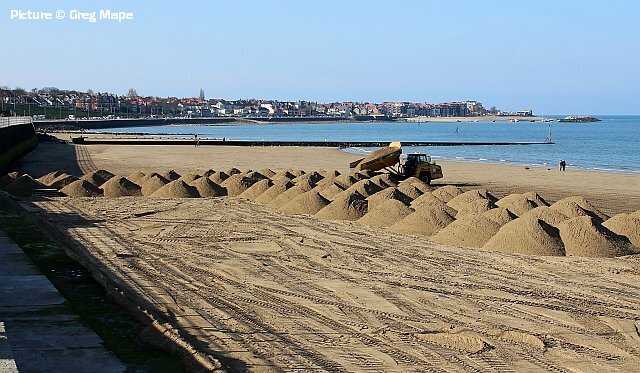 ... making great piles of sand, It looked like massive sandcastles being built. 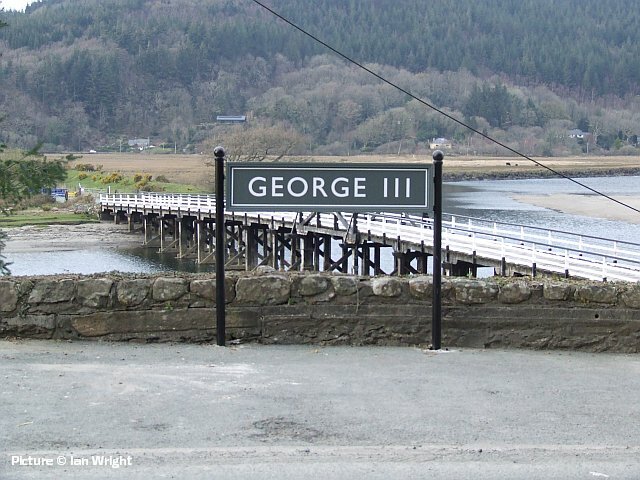 The 'George the Third' at Penmaenpool on the Mawddach Trail (ex-Cambrian Railways Dolgelly branch) has recently re-opened after being taken over last year; it has been closed all winter for a refurbishment. It is now a Robinson's tied (tide?) 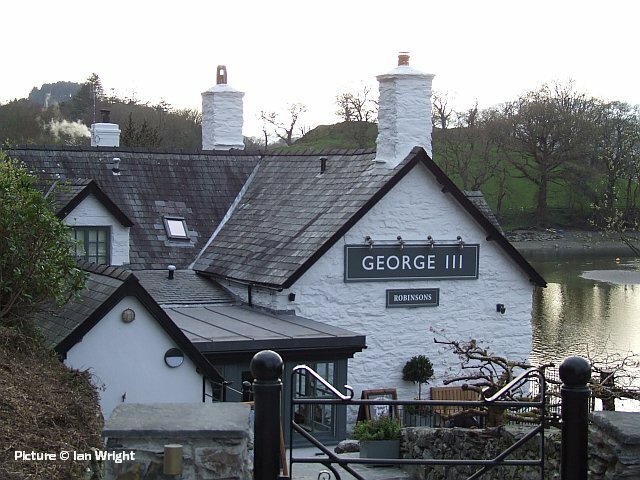 house with only their beers on the bar. New signs all round with a railway theme. 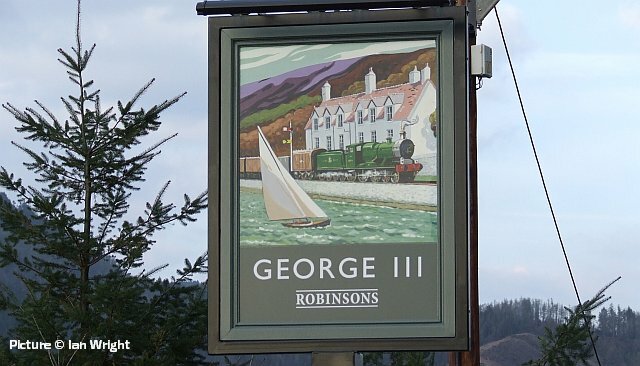 Robinson's new corporate lettering and colour prevails, but the wheel arrangement of the loco on the sign looks unlikely. The actual preserved signal on the quayside hasn't been repainted and is starting to look a bit tatty again.